FILE - A photo shows a general view of one of the biggest camps for people displaced by Boko Haram and likeminded Islamist extremists in Maiduguri, Nigeria, Aug. 28, 2016. MSF says the current cholera outbreak in Nigeria started in Maiduguri but is increasing rapidly in nearby towns. Health workers in northeast Nigeria said Tuesday that they were striving to contain a cholera outbreak that's sweeping through camps for those uprooted by Boko Haram. More than 2,600 people have been infected and at least 48 have died so far in Borno state, heart of an insurgency by the Islamist militants and the disease outbreak, which began last month in a camp for the displaced, the health ministry said. A major vaccination campaign aims to reach more than 900,000 people this week in the area, and aid agencies such as Medecins Sans Frontieres (Doctors Without Borders) said they were stepping up efforts to halt the spread of the diseases as new cases emerged across the state. About 1.8 million people have fled their homes because of Boko Haram violence or food shortages, and nearly three-quarters are now in "cholera hotspots," the United Nations said this month. "These lifesaving vaccines will play a vital role in slowing the spread of the disease, buying valuable time to put the right water, sanitation and hygiene infrastructure in place to stop the root causes of this outbreak," said Seth Berkley, chief executive of GAVI, the global vaccines alliance, in a statement. 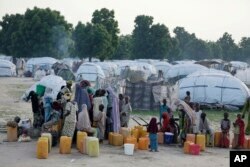 FILE- People displaced by Islamist extremists fetch water at the Muna camp in Maiduguri, Nigeria. While the outbreak started in Maiduguri, capital of Borno, the number of cholera cases is increasing rapidly in the nearby towns of Monguno and Dikwa, according to MSF. "We are worried that the number of beds currently planned may not be enough as cases continue to rise in Monguno," Félix Kouassi, MSF medical coordinator, said in a statement. Efforts to contain the outbreak are being hindered as people are failing to report suspected cases to the authorities, an official from the U.N. children's fund (UNICEF) said last week. Cholera spreads through contaminated food and drinking water and can kill within hours if left untreated, but most patients recover if treated promptly with oral rehydration salts. The latest figures represent a 1.8 percent fatality rate — above the 1 percent rate that the World Health Organization rates as an emergency. The short incubation period of two hours to five days means the disease can spread with explosive speed. Boko Haram's eight-year campaign to create an Islamic state has killed at least 20,000 people, uprooted 2.7 million and sparked one of the largest humanitarian crises in the world.